IFTTT - All about apps in YOUR classroom! On of my favorite new apps is IFTTT. "What is IFTTT", you say? Well, IFTTT is a great app and website that allow me to automate many classroom tasks. The idea behind IFTTT is that "if this happens, then do that”. I have a contact form that sends me an email any time a parent or student has a question. The problem is that I don’t always check my email and I may miss a submission. The solution is to create an IFTTT recipe that says every time I get an email with the subject “New Form Entry: Contact Form” send me a text message. Since I always have my cell phone handy, I set up this recipe and am immediately alerted. Another recipe that I use a lot in my classroom is "every time I take a screenshot upload a copy of it to my Google Drive". This allows me to have material handy that I may want to use for a presentation. In my classroom, the students can bring their own device, so I can use IFTTT for the ticket out the door. I created a hashtag of #TOTD which stands for ticket out the door. The students put that in their email and it will automatically save all responses with that hashtag to a folder I created in my Google Drive. If students have to bring a book to class every Friday, for example, you could set up a “Recipe” to tweet out "IF Every Thursday at 8:00 PM to Post a new tweet to @mytwitter reminding students to bring a book". One of the things that make the IFTTT app really useful is that there are literally thousands of “recipes” already made and shared. At this time, there are over 3000 pages of shared recipes from IFTTT users besides the great ones that you yourself can create. 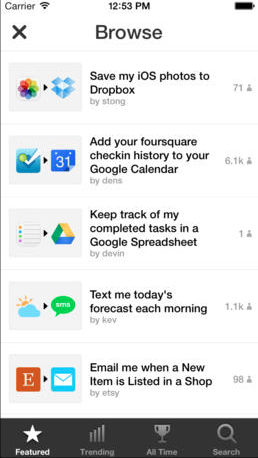 The IFTTT app allows you to create all of these great actions on your portable device.